Theodore William Richards was born in Germantown in Philadelphia, PA on January 31, 1868. He was the fifth child and third son of father William Trost Richards who was a famous landscape painter and mother Anna Matlack who was a poet. Because of the poor quality of schools in Philadelphia at the time and the family's frequent travels, Richards got his elementary education from his mother. The boy's early desire to become a painter like his father had faded by the time that he was thirteen. At thirteen he received a large box containing materials and apparatus for 200 experiments "warranted to be safe and instructive". Richards recorded his progress, "Soon afterwards, ... I had nearly blown my head off with this outfit." Richards interest in chemistry was sparked and he obtained and read several basic chemistry textbooks to increase his knowledge and safety. In 1883 he entered Haverford College in Pennsylvania. There he studied chemistry and astronomy graduating in 1885. From there he went to Harvard to study under Josiah Parsons Cooke, a family friend. There he finished his B.A. in chemistry in 1885 and his M.A. and Ph.D. in 1888, publishing a joint paper with professor Cooke on the atomic weights of hydrogen and oxygen and three other papers on his own. After finishing his Ph.D. Richards spent a year at Gottengen, Germany where he worked under Paul Jannasch and Victor Meyer. Upon returning to Harvard Richards was appointed assistant in chemistry in 1889, instructor in chemistry in 1891, assistant professor in 1894 and professor in 1901, after passing up a professorship at the University of Gottengen. In 1895 he spent another year in Germany working with Wilhelm Ostwald and Walther Nernst. These two trips to Germany served as Richards introduction to physical chemistry. At the time there were no centers of physical chemistry research in the United States. Half of Richards' research involved determining the atomic weights of the elements, starting with work on oxygen and copper in 1886. By 1912 he had accurately determined the atomic weight of thirty common elements. Richards also studied atomic and molecular volume and formulated the hypothesis of incompressible atoms, carrying out experiments on the compressibility of many elements and compounds using apparatus of his own invention. He was awarded the Nobel Prize for chemistry in 1914 for his work on atomic weights, but was unable to travel to Sweden to accept it due to the outbreak of World War I. 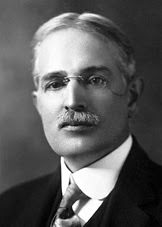 He also received the Davy Medal from the Royal Society in 1910, Willard Gibbs Medal from the American Chemical society in 1912, and the Franklin Medal from the Franklin Institute in 1916. Richards continued his teaching and active research up until his death on April 2, 1928.